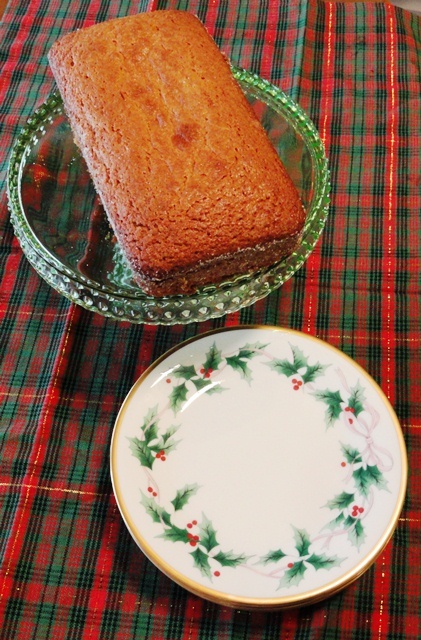 Bake and wrap up this festive recipe, Eggnog Amish Friendship Bread, as gifts for family and friends during the holidays! Sweeten this recipe by adding in 1 cup of white chocolate chip that has been tossed with a small amount of flour before adding the chips to the batter. If you use a glass loaf pan or dark loaf pan, decrease the oven temperature by 25° F.
In a large bowl, combine starter, oil, eggnog, eggs and rum extract. In another large bowl, combine flour, sugar, baking powder, baking soda, salt and pudding. Pour the batter evenly into loaf pans and sprinkle the remaining sugar-cinnamon mixture on the top. Just made this! Came out perfect and yummy! Thanks for the recipe! Yay! The Eggnog recipe is available now–it wasn’t showing for a couple of days. Thanks! I don’t use jello brand, I use store brand… its only about 50 cents a box at walmart and even cheaper at a bulk store or a disount grocery (we have sav-a-lot) here. I tried this as a bundt! I gave several of my neighbors mini bundts this year for Christmas and eggnog was just right.